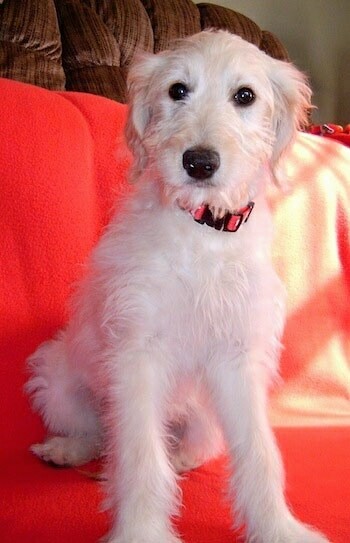 "Annie the Goldendoodle (Golden Retriever / Poodle mix) puppy at about 7 weeks old—Annie was bred at Pin Oak Farm. 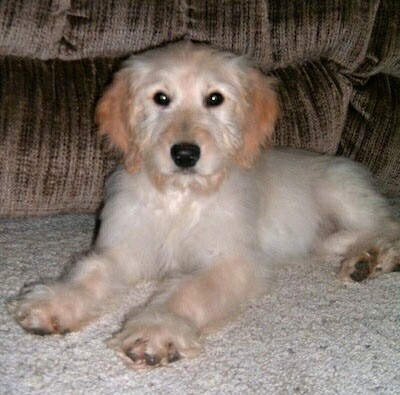 Her mother was a Golden Retriever coincidentally also named Annie and her father was a standard size Poodle named Rodeo. She was born with her 9 brothers and sisters. She loves everybody and everything; she just loves being alive." 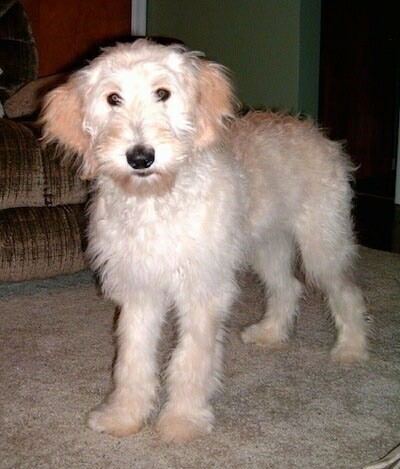 Annie the Goldendoodle (Golden Retriever / Poodle mix) puppy at 6 months old—"She loves to walk, mostly because she likes to be nosey and to strut for the other dogs or the neighbors. Even in the heat, she still pesters to walk and we walk about two miles a day. She also loves to ride in the car and she just sits there and watches. She will sit on our front porch real nice and watch as well. As you can tell, not much goes on that doesn't interest her." 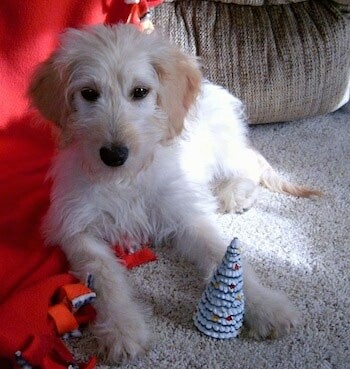 Annie the Goldendoodle (Golden Retriever / Poodle mix) puppy at 7 months old out in the snow—"We fenced off our yard so that Annie has room to run. She owns the yard and chases rabbits and birds out. She has an obsession with balls and we play catch nearly every day, which she loves. She watches the ball with such intensity." 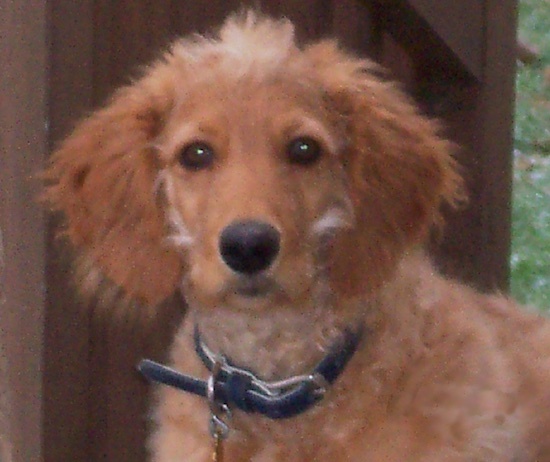 Annie the Goldendoodle (Golden Retriever / Poodle hybrid) puppy at 8 months old wearing a red bandana—"As we've seen on some of the doodle owner club sites, Annie sleeps on our bed at night on her back, which seems to be a Goldendoodle trait. 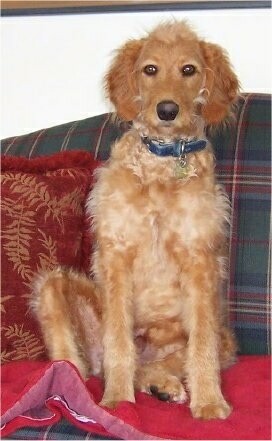 She often looks like the horse in the dean's office in 'Animal House' (legs extended up)." 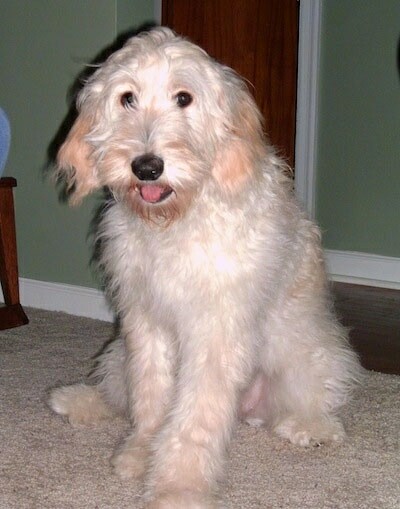 Annie the Goldendoodle (Golden Retriever / Poodle hybrid) puppy at 9 months old—"She has grown to 49 lbs. now and she still draws a lot of attention; the novelty of her has not worn off. Even the tough young guy in the neighborhood coos, "Just the cutest little puppy in the world" as we walk by. At Petsmart, she was being groomed last week. We stuck around waiting in the wings as they were finishing up her haircut. It is a 3 to 4 hour event. It was incredible to see the amount of people who would stop by the window, grab their spouse or friend, and point and talk about our dog. Some even were brave and went in to ask about her or to pet her. I bet 30 people stopped and about a half dozen went in in the half hour we watched." 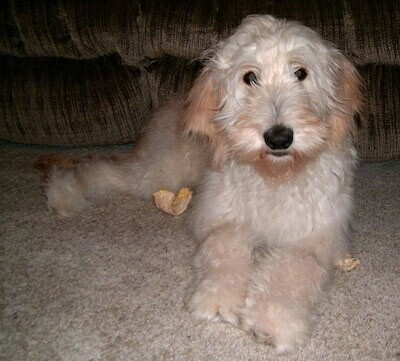 "Jackson the Goldendoodle at 5 months old looking very innocent (NOT!) has the most adorable little Mohawk on the top of his head which makes him appear a little goofy sometimes, but he has the personality that goes right along with it." 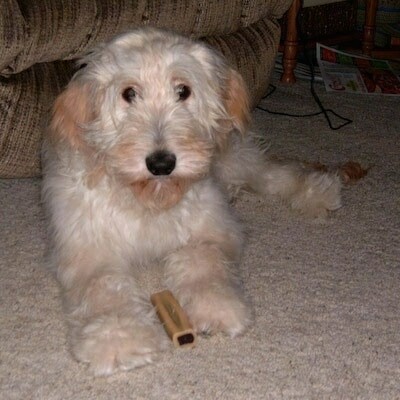 Maggie the champagne Goldendoodle as a puppy—"Your website was very useful in our decision to purchase a Goldendoodle, so thanks for your service! 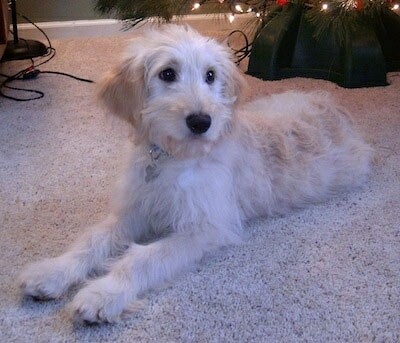 Had it not been for your website, we would not have known that Goldendoodles existed! We are so happy with ours and thank you very much!"